Young Man at the window (part 2), originally uploaded by _Abi_. Once I had to move out of my apartment for two months while steam pipes were replaced. I worried about what would happen to the squirrels. They were used to my feeding them fresh peanuts every morning. I wouldn’t be there for them–and it was winter. When construction workers arrived on the first day, I told them my concerns. It didn’t help that they guffawed at me. “Don’t worry. We’ll just shoot ’em!” One even said “I like squirrels–in a frying pan!” These were tough, macho guys, after all. The construction site was off limits, but every day I would come by and throw peanuts over the fence into my garden so the squirrels would have something. Did they miss me as much as I missed them, I wondered? Toward the end of the project, I was allowed back in to see the work in progress. When I walked into my apartment, what did I see but one of those tough construction workers out in the garden, feeding some of his sandwich to a squirrel! So in the end, these little creatures managed to win over the entire crew, once again proving the importance of good P.R.! All those times you thought you were going crazy, when you misplaced something and never could figure out where it was! Remember how I inexplicably lost a juggling ball? Judging from the above video, this kind of thing happens more than we know. Another example: A neighbor of mine was the proud new owner of a fancy bird feeder. I helped her install it securely on her fire escape, three floors up. From her kitchen window, she loved watching the birds feasting. Then one day the feeder was gone–vanished! She called me and I commiserated. What kind of a person would steal a bird feeder? How low can you get? A few days later I spotted the birdfeeder, empty and lying on the ground. Aha! So no human had stolen it after all–enterprising squirrels had managed to haul the entire thing away, dragging it off to their secret hiding place! Political Aspirations, Washington DC, originally uploaded by yorkie. Official Washington, DC, is a grand city with sweeping avenues for motorcades and parades, and white marble government buildings for the most serious affairs of state. But if you take time to look, you’ll see that our little animal friends go on with their busy lives among all this pomp and circumstance. On Pennsylvania Avenue, exactly where I waved to a president going by in his motorcade, I saw a squirrel emerging from a trash container. Oblivious to the importance going on around her, she had a big, fat bagel in her mouth–her triumph of the day. My office used to be on the ground floor of the National Gallery of Art. I was lucky because it was the former office of the director, so it had a beautiful huge window that looked out over a hidden, shaded glade. One day I was on the phone when I saw a squirrel with an entire, huge fried chicken breast, complete with wing, in his mouth. Oblivious to my watchful eyes, it proceeded to hide the chicken in the corner of my window, using leaves to cover the prize. When I came to work the next day, the chicken breast was gone. 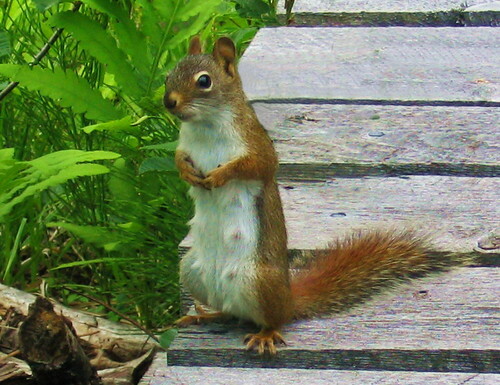 Isn’t it comforting to know that in the backdrop of our nation’s major events–motorcades, funerals, and demonstrations– we can rely on Washington’s squirrels to provide the continuity of Nature? Please let me past – my babies need me!, originally uploaded by don moorcroft. After several weeks confined to the nest, squirrel babies are ready to make excursions with their mothers. Then the little ones busy themselves with learning how to move around their environment. The mother watches from a distance, and at night, the family goes back to the nest. One spring day I heard the most awful racket in my garden. When I looked out, I saw the problem: the mother squirrel was refusing to nurse the babies anymore. Imagine the shock and the hurt feelings of such a moment. The mother you’re depending upon and who has fed and looked after you has suddenly turned indifferent! The alarmed babies were chasing and calling after their mother, who eventually left them alone in the garden. The photo above perhaps hints at why mothers are eager to move on from nursing. But still, I can’t help but wish this cruel moment of abandonment didn’t have to happen. Needless to say, I couldn’t bear seeiing these poor babies in such a pitiful fix, so for the next few days I made sure to put out copious amounts of peanuts. Come to think of it, the mother squirrel probably knew I would do that! Baby squirrels, originally uploaded by ucb411. After about 44 days of gestation, baby squirrels are born–hairless, blind, and unable to leave the nest for several weeks. A mother squirrel might have two to six or so babies, so she must somehow eat well but stay close so she can nurse. All this happens during the dead of winter, when food is likely to be scarce, and the weather harsh. It never ceases to amaze me how hard these wondrous animals work for the wellbeing of their young. One winter I watched for an hour as a mother carefully moved one baby at a time from one tree to another, probably because the nest had fleas. Grasping the baby gently in her mouth, she would carefully climb down the tree, run across the street and up the new tree. After she would place the baby in a hollow, back she would go to get another baby. I counted six babies! I couldn’t believe my eyes. Yet other pedestrians were oblivious to the wonder that was happening right above them. When I would tell them excitedly what was going on, I got some strange looks, and mostly people would just rush on by. Humans! I can’t figure them out sometimes. Have you ever seen squirrels chasing one another, sometimes several at a time? 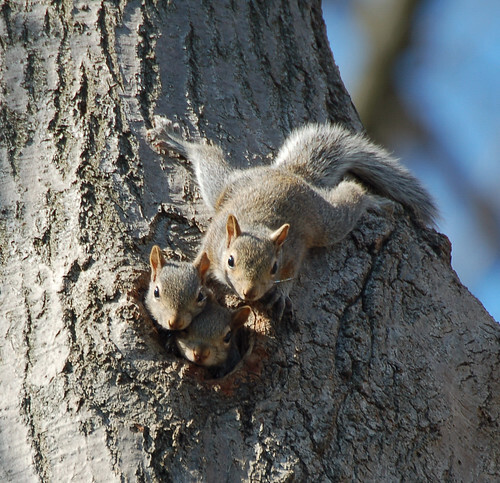 A typical scene during certain seasons is of three or more critters scrambling up and down the trunk of a tree, with much gleeful hiding, stopping, listening, and flicking of tails. What explains this? Well, it is part of an elaborate mating game that lasts over two weeks. The process kicks off when a female is almost fertile. It takes at least two weeks of vigorous exercise for her to ovulate–nature’s way of forcing the males to compete by chasing her for that long! Day after day she will lead the pack, with hopeful males trailing and puffing away on this marathon. The chase is so gruelling that the young and weak males fall behind, leaving only the strongest as finalists. During this time, the female is carefully observing the contestants. She is looking for the strongest, fittest one to be the father. Isn’t Nature a sly one? Finally, when the female is in heat, she sneaks up close to the male she has chosen, and she signals his success by–are you ready?–sneezing! So next time you hear a squirrel sneeze, you’ll know what is going on. One December I was observing this ritual for over two weeks. I had heard the female sneeze, so I was looking out at the snowy patio when the amorous pair tumbled right in front of me. They were playful and sweet; really quite affectionate. It was exactly winter solstice: Christmas day. The promise of new life to come. Some day when you need a cheap but fun activity, try squirrel fishing. It’s really simple. Get a long string or, if you have one, a fishing rod and reel, without the hook. For bait you can use peanuts in their shells, or bits of apples or whatever you think the local squirrels will go for. 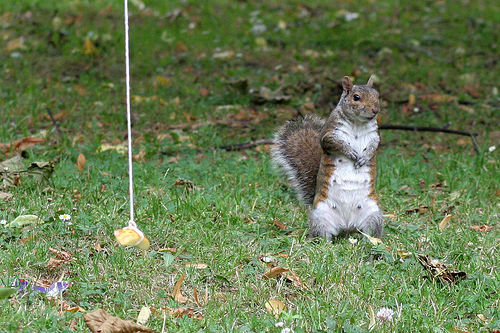 You wind the string around the bait, then cast it out where you think there might be some squirrels. When a customer grabs the bait, start pulling in the line and be prepared to laugh as you watch the ensuing antics. I used to spend endless hours with a friend of mine squirrel fishing. We invented variations like casting the bait over an open door so it would dangle in mid-air. The squirrels would jump up, grab the bait, and we would start reeling so the squirrels would be suspended really high. They just wouldn’t let go of their prize! The Ironies of "Free Willy"